Vortex, a young Chennai-based company, could be adding new energy to India's rural economic growth with its award-winning solar-powered automatic teller machines (ATMs). 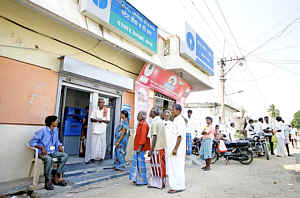 Called "Gramateller Indi" ("graamam" means "village" in Tamil), the low-power consumption machines operate at one-tenth the cost of conventional ATMs. State Bank of India, the country's leading banking chain, has already ordered 300 Gramatellers; 19 other banks are using these sun-powered cash venders in villages and small towns. The immediate demand for the solar ATMs reflects and empowers India's quietly surging rural economy, estimated to be worth about US$450 billion. Rural India, considered the backbone of the national economy, is expected to overtake the urban market in size by 2017. Mahatma Gandhi's famous saying that "India lives in villages" is still strongly relevant, with 70% of the population resident in rural regions - nearly 30% of India's more than 930 million telecom subscribers live in villages. Village residents with bank accounts, and their numbers are steadily increasing, welcome not having to travel to a nearby town to withdraw cash. India's banking industry has in recent years identified the potential of the rural market, but logistics and associated costs have hindered full-scale expansion. Even so, State Bank of India more than quadrupled its rural presence in two years, from 12,000 villages in 2008 to more than 50,000 villages in 2011. The Gramateller will help to cut costs by helping banks set up ATMs instead of full-service branches in areas where power supply might be erratic or totally absent. The Gramateller was a brainchild of the Indian Institute of Technology (IIT), Madras (Chennai). Vortex founders Vijay Babu and Lakshminarayan Kannan, both IIT alumni, aimed at enabling small towns and villages, considered unviable banking options, to have a banking and ATM facility for the first time. Babu and Kannan's initial efforts with solar-power ATMs were greeted with disbelief by bankers. Villagers folks were also skeptical - until they experienced how ATMs could help them directly access their cash. Less than a decade after they embarked on what seemed a hare-brained scheme, Vijay and Kannan found themselves in TIME magazine's 2011 list of "10 start-ups that will change your life". They were also among 31 visionary companies selected as Technology Pioneers 2011 by World Economic Forum, and finalists of the Wall Street Journal Asia Innovation Awards in 2010. The Gramateller Indi, which need only about five hours of good sunshine per day, use solar panels to convert sun rays into electrical energy; the electricity is stored in a battery that runs 24 hours a day. The ATMs can survive power fluctuations and have power failures and have a built-in battery back-up for four hours. "Solar power for ATMs is viable only if the ATM consumes less power [than traditional sources] and does not need air-conditioning, as is the case with Gramateller," Vortex founder Babu told Asia Times Online. "This demand for solar power is different from that found in developed countries, where it is wanted more for its non-polluting nature." A single Gramateller unit saves more than 90% of the annual costs of maintaining a conventional ATM, half of whose annual bill of 144,000 rupees (US$2,530) goes on air-conditioning, electricity and generator running costs. The solar ATMs can function in temperatures from 0 degrees to 50 degrees - and without air-conditioning. ATM security guards may be the only people with a grievance against the new devices - they can no longer sit or sleep in ATM cubicles in cool bliss. Maintenance may not be much of a problem with solar ATMS, but Babu discovered other problems - the solar panels require a shadow-free area, and environmentally healthy local efforts to plant more trees can get in the way. One particular ATM location in a village in Punjab had to be moved several times to escape the shadow of trees growing nearby. Babu is convinced solar-powered ATMs are appropriate across India and further afield, not least in cities where extended power rationing is common. "We have deployed our solar ATMs in Nepal, Bangladesh and Dubai," said Babu. "About 20 Gramatellers are deployed in large cities, the number being restricted since our main focus so far has been on semi-urban and rural deployments." Vortex plans for expanding in Asia received a boost last month when the Washington-based World Bank's International Finance Corporation (IFC) on June 25 announced a $2.7 million equity investment in Vortex. "The investment will help in taking basic banking and financial inclusion schemes to rural and semi-urban areas in India," says Thomas Davenport, IFC Director for South Asia. "Bringing banking close to home means a lot in a country where less than one-fifth of over 600,000 villages have a banking touch-point." IFC expects the ATM market in India grow three-fold over the next three years, with the bulk of machines bound for remote areas. The Indian government plans to extend banking services to remote areas, and the rugged solar ATMs fit the bill. "Several members of the IFC team have used Vortex ATMs and the experience is not very different from using a conventional ATM," Davenport said in an e-mail to Asia Times Online. "The flexibility to work on alternate/renewable power sources is truly meaningful especially because many parts of South Asia do not get traditional power supply. These ATMs work on both normal power and solar sources." The solar ATMs could be the biggest blessing yet to serve the rural banking industry, which made a net profit of $347.96 million in 2010-11, and grew 5.5%. Saving bank deposits increased by $2.62 billion in a year, according to the Reserve Bank of India report "Trend and Progress of Banking in India 2010-11". The IFC too sees India's rural markets growingly significantly in coming years. "Many of our investments are geared to facilitate financial inclusion in such markets," said Davenport. "This also meshes well with the intent of the Reserve Bank of India, which is supporting greater branch outreach and financial access in rural/semi-urban India." The Indian government plans to have a mini-banking facility in each of India's 600,000 villages, with an aim of opening about 25 million savings accounts in villages. Vortex expects to install about 5,000 solar ATMs in India by 2015, though the demand for the sunshine-powered cash venders could be 10 times as much.